I wear tri-focals so sunglasses are like... right. My hubby wears prescription glasses. He went to LensCrafters and picked out regular prescription glasses, and got them tinted. You can even pick out how dark you want them to be. Its a pretty easy process. They can be polarized or anything, but the tints are working out great for him! I don't know how that would work with trifocals, there may be a line separating the lens sections...but it's definitely worth a try! I am with you! $150 a pair a 70 MPH and you turn your head and they are gone. I started a company ROADSpEX and sell two pair for about $20. I wear them for riding and sell them on line. I dont make much but I have a several year supply for myself and friends. Hey One Harley Rider, send me a free Road Spex t-shirt, and I'll wear it on my rides, and tell people about your glasses. The same conclusions can be drawn from your purchase of an Electra Glide Ultra Classic at roughly twice the price of a similarly-equipped metric that does exactly the same thing. For the most part, what you say here is pretty much how it really is. I have found a few rare exceptions. 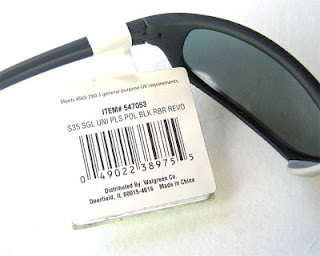 I have a pair of Revo's that I bought after I had LASIK eye surgery 6 years ago. After an entire life of never being able to buy a nice pair of shades "off the rack," I sort of went nuts. At the same time, I bought a second pair for about 40 bucks. Today, I still have both pairs, but the 40 dollar pair is starting to show it's age. The Revo's are like new still. The only time I see where the Revo's earn their price tag is when we get a snow storm, followed by a very sunny day. The Revo's kill the intense glare from the snow better than any other shades I have. In the summer on the beach, I can just about stare at the sun with them on, they are that good. As far as riding glasses go, it seems every time I buy the cheapies, the foam comes off after about a half dozen rides. I had one $20 pair that the earpiece broke off of after about the same time. I spent $60 on a new pair where you can change the lenses between smoke, clear, and yellow and have had great luck with them so far. To some degree, you do get what you pay for. Then again, what are you using them for, and how often? I bought a pair of motorcycle sun glasses at a trade show and they broke. Glad I didn't spend big money having them customized with prescription lenses. I changed the type of helmet I wear so that I can wear whatever sunglasses or prescription eye glasses I choose to. As my wife indicated, I wear a pair of presciption eye glasses. I have two pairs and they are Ray Bans from Lens Crafters. One is clear and the other is tinted. Both were several hundred dollars each. I will tell you this: I will have them both for more than 2 years. My previous pair of prescription glasses lasted over so many years I lost count. I don't spend that kind of money to lose, drop, misplace or abuse them.